Barb and I are back from cross stitch market which was held in Nashville. Our new fabric line arrived while we were gone. Nothing better than getting home and opening large boxes and seeing yards of new fabric waiting to be sewn into something fun! As many cross stitch shop owners don't go to quilt market I'm giving you a sneak peek here on the blog. The prints are grouped in the basket above to give an idea of the color range. The quilt under the plate shows a tiny bit of our large scale cross stitch print. It comes in several color ways. We love how it turned out....it's just wonderful! 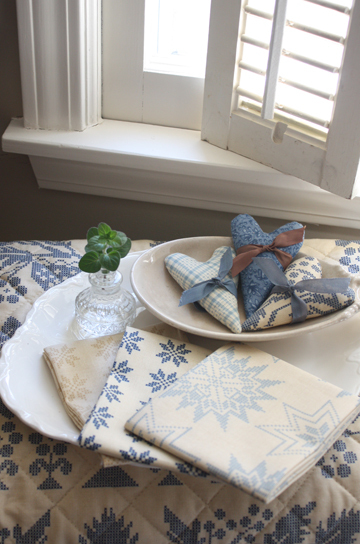 The three fabrics on the plate and the small hearts showcase some of our other prints. The name of this line is "Nature's Basket." Cross stitch market was a lot of fun. We loved seeing the shop owners and having a chance to visit....although a very short visit, much fun nevertheless!. We always leave wishing market was a bit longer. One of my favorite patterns from market was Barb's Honeybee Hill. The bees buzzing and the birds singing really capture an ideal summer day. The sewing box was made by Stephanie Elmer. She has a woodworking shop and has made these boxes as gifts for friends for years. She recently was convinced to turn this passion into a business venture. These boxes come in several colors and different sizes too. Her contact information is located inside the pattern. We took 20 boxes to market to sell to shop owners....they were gone in an hour! Here's the deal.....I've got one box to give away. You all know how this works. Leave a message in the comment section. I will use the random number generator to find a winner. The contest will end on Friday and the winner will be announced on Saturday. Good luck to all! Hope you win. What a lovely giveaway! I'd LOVE to have that beauty of a box. love the softness of the new color line and fabric's.. hope you share more of your time at market with us. Thanks for a chance at the gorgeous box.. a perfect pin cushion.. Please enter my name for the box. I already have the pattern and can't wait to get this stitched. I love bees! Oh, lovely--thank you! I would love to be entered in the box give-away. I have seen it up close and it's gorgeous. And of course, I already bought the Honeybee Hill design. I just love the new fabric! Perfect for sewing up a project bag. And Honeybee Hill - a must have! Please include my name in the draw. Thanks! What beautiful new fabrics - my fingers are itching to get started on something new using this range - please enter my name in the draw! What lovely fabrics - my mind jumped to all kings of projects! 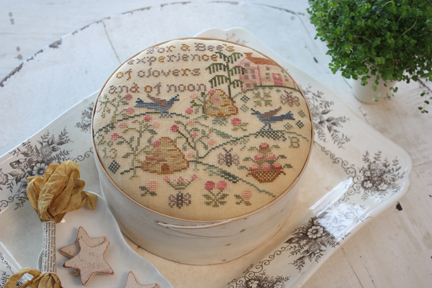 Please enter my name for the lovely box - I would love to stitch that design-love bees & skeps! Love the beautiful blue fabrics!! I would love to be included in the drawing for the box also. If you listen really close those fabrics are just screaming my name!! We have all fallen in love with this box, only to find that her web site is not working. I'm sure this will change. I bought the pattern and threads last week, and will be starting the stitch soon. This and Dear Daughter were my favorites of your new items. Have to go read about the quilt fabs again...I thought Field Notes was the new line. Would love to win the box. Thanks for all the new fun! OMGosh what a wonderful giveaway! Please count me in! And I am SWOOOOONING over those new fabrics!!! Gorgeous! I love this booklet and LOVE the new fabrics....will have to pick some of them up. Ohh! A mix of cross stitch with quilting. How wonderful. Will definitely be looking for this line! Beautiful new fabric line! Honeybee Hill is the sweetest too! Please enter me in the drawing and thanks! What a fine drawing! I came across recently for your wonderful blog, I already get some inspiration here and fin dei cross stitches so wonderful! Maybe I'll get lucky! The new fabric designs and stitching charts are WONDERFUL! Kudos to you both. I heard a rumor that the box might be used for future stitching designs. It would be lovely to win one! How fun! I have that chart on order from my local shop. I'd love to win the box. Many years ago I stitched reproduction samplers then switched to quilting and have just returned to stitching samplers again in the past year. Your new fabric line is lovely and in my favorite color so I'm sure I'll have to buy some of it when my LQS gets it. Love everything you come out with. The box is beautiful as well. Honeybee Hill is my favorite pattern! Would love to win a box to use with my stitched piece! Thanks. Would love to win this beautiful box!! Thanks for the offer to win this!!!!! Honeybee Hill is a lovely design, and the box is gorgeous! I'd be as thrilled as anything to win! Picture me jumping up and down with my hand in the air, saying, "Me, me, me," just like my students do! Gorgeous fabrics and another great cross stitch design! Well now that I finished drooling all over my keyboard, I would love to be entered in your giveaway. That is just the most beautiful fabric I have seen this far. I've already got the pattern. Wouldn't it be so fun to win the box to go with it?! I'll cross my fingers. Count me in! What a beautiful box! Glad you enjoyed Nashville! You and Barb always amaze me with your new designs. I love it all. The box and chart are my favorites this year. WoW! Lots of gorgeous goodies! Fabric and designs are a wonderful. The sewing box is awesome as well. I can just imagine it next to me when I'm stitching, hehe. I would love to win your box. Y'all's new designs are great! Happy Stitching! I love the new designs and would love this box to go with it!! Love love the new fabrics, now aht can I make with them. I love boxes please enter me in your generous givaway. HI! THIS IS SO SPECIAL-THANK YOU FOR SHARING! 'NATURE'S BOUNTY' LOOKS LIKE A WINNER>LOVLEY! Your new fabric is wonderful and so is the box! Please enter me in the drawing, thanks for sharing. Beautiful fabric! The box is gorgeous - cute pattern. I can see why they sold out, the box and the stitchery are beautiful. I also love the new fabric line, that would make a beautiful bed comforter. Love the fabrics and the box is great. I would "BEE" so happy to win this box! The cross stitch compliments the box perfectly....love the new fabric line...heaven! Curious to know if you like Cross Stitch Market better - or Quilt Market? I'll bet they're both good! I would love to have one of the boxes. They are beautiful. What lovely new fabrics. Please enter me in your generous giveaway. 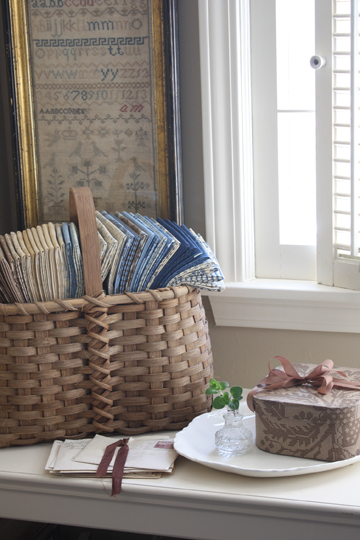 Your new fabrics are beautiful - blue is my favorite color so I love the samples shown. I am almost finished with the Honeybee pillow and love your new designs also. Please enter me in your drawing - I would love a chance at the box. Thanks for the opportunity to win! The box is absolutely wonderful. Love the new fabric too. Oh my goodness! What a treasure. Thank you for the chance to win. I love this new pattern and would love to win the box for it - love your new quilting fabrics too - am anxious to see the whole line! I would love a chance at the box! I have Honeybee Hill on its way to me as I type.. Can't wait to get it! I love your new fabrics too! Wow! I'm drooling over the gorgeous fabric! Thanks for the giveaway! Oh, how lovely! 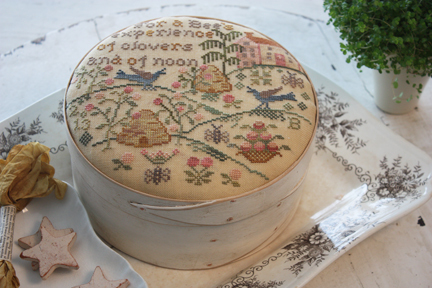 Count me in... Love your new fabrics, and the honey bee cross stitch is so very sweet! OMG! Please include me in the great give away and pick me! I absolutely love, love the new fabric line! The box is wonderful too and that design is perfect for it! I would be so happy to win! That's a beautiful sewing box! Love your new fabric line... those blues are calling my name. What a lovely color range! Please please.. include me in the give away... I'd be so SO happy to win! Can't stop thinking of all the things I could make with it ! Wow, love the fabric. Thank you for a chance to win that beautiful box. Throw my name in the box or hat....grin. Just lovely. So beautiful fabrics, please include me in the giveaway!! Love the new fabric and also the wood box. Send it, along with the gorgeous pattern to me please!! Thanks. This is my favorite pattern of your new releases. Please enter me for a chance to win the fantastic box. Just beautiful.....would love to add to my country home.....Linda McK. Wow! I would be delighted to win one of these little delicate feminine boxes. And the new fabric line has my head spinning as I come up with different ways to use it. Whats the new line of fabric called? I want some! I can see why they sold out in an hour, too cute..
Love the look of the new fabric line. I was so anxious to see what came out of cross stitch market. Luckily, my LNS had a market day and I was there when the doors opened. I couldn't wait to see what you and Barb came up with, as usual. Now I can't wait to see what you all do with this new line of fabric! Oh I would love to be the lucky one! This is so pretty. Thank you for the opportunity! What a lovely giveaway!! Love the new colors in collection, so soft! The little honeybeehill is beautiful!! I just ordered that graph. I love it and it would be great to win the box. Now I hope that you have a new quilt book coming out soon to go with all that beautiful fabric! Honeybee Hill was my favorite pattern from market !! Both the top and pin cushion are right up my alley...or should I say hive !! LOL I would love to win the box. It is lovely. I'm in love with the new charts have have them ordered! It would be a fantastic windfall to win the shaker box, its gorgeous! Love your new fabrics and cross stitch designs. Would love to be the lucky winner. Your new fabric us a winner again. Thank you again for your creativity. I love your new fabric line and I would love to win the box! Love the whitwashed look of the box....and the bee design in it!!! Please enter me in your drawing and thanks so much for making this opportunity possible! I just ordered the pattern and would love to have the box to go with it. It is a beauty, and adds so much to the entire look. Thanks. What a pretty box....looking forward to stitching with the new fabric, too!!!! Shepherd's Bush has this box at their shop, it is wonderful. I would love a chance to to win. What a sweet pattern and giveaway. Thank you. Wow, a wonderful giveaway. Thanks! Love the new fabric can always put to use those cross stitch prints! I loved see you and your items at market was way to late in the booth to even know about the boxes would love a chance to win one. Stephanie does lovely work wish I was daring enough to work with power tools! I love your new fabric line, love those blues. Please enter me in your very generous giveaway. Thanks so much. The new fabrics are gorgeous! I love the sewing box...thanks for the chance to win. Oh Barb and Alma, I would love to have this box. This pattern was my Market favorite. I'm also lookig forward to receiving my BBD Ladies Prim Society design!! The new fabric looks wonderful, I love the colours. Please add my name in your giveaway for a chance to win the lovely box. Your new fabric is wonderfull again and your cross sitch pattern is looking great to. Thanks for the chance to win it. What a gorgeous box and cross stitch pattern. The new fabric is beautiful too. Wow, the new fabric is...wow! Honeybee Hill is my favorite of your new patterns. I can see why the boxes disappeared in an hour. I hope I win one! Oooooh! I could do so many fun things with that box. Please, please, please pick me Mr. Random Number Generator! Market sounds wonderful. I wish I could have been there this year. Your fabrics are beautiful and the stitched box is rustic and beautiful. Love the new fabrics that are coming out and the Honey Bee needlepoint pattern is truly wonderful. The box is a beauty, thank you for offering us the chance to win one. Oooh, so pretty! Love the fabrics and the new pattern on the box and the box itself. Beautiful color stain/paint on the colonial box. Love also the new blue cross stitch fabric. How fun for all sorts of projects!! Such a generous giveaway! I love all the new releases from market is year and I can't wait to get hands on them. I LOVE that little box. It is just precious. I also love the new fabric.........but then again I love everything you do! Please enter me in the drawing. What a great give away! That box of goodies would be more than welcome here at my house! Beautiful! Your new fabrics are lovely!! The little box is one I need to look for if I am not the Lucky winner!! Thank you for the opportunity! Please enter me in your giveawy. I would love to win this box. ooh, thanks for the wonderful opportunity, the box, and pattern too, are simply gorgeous! Love the new fabric too. Oh my! Your new fabrics are so yummy! I have been eyeing the Honeybee Hill pattern and waiting for my LNS to let me know it arrived!!! Please enter me for a chance! I would LOVE to own one of these beautiful boxes. Thank you for the chance!!!! Lovely giveaway! Thanks for the chance. Your fabrics are beautiful. I love the new fabric! That box is neat, please enter me in your giveaway. Thanks for the chance. Les tissus sont magnifiques, comme d'habitude! Félicitations! Une très bonne soirée, à très bientôt! Love that fabric! Loved all your market pieces too. I'd so love to win the box -- it's so nice! Thanks for the chance! Thank you for the chance to win the box. I purchased the pattern already from my ONS so it would be a great addition! The new fabric line is so pretty...it makes me want to quilt too! New fabric, new cross stitch designs and all the accessories makes for some fun and excitement. Can it get any better? Love your new designs and the new fabric line looks lovely, too. My order for honeybee hill should arrive tomorrow and I would be honored if I had a chance to win this beautiful shaker box! Thank you! Thanks for this chance to win such a gorgeous piece of art!!! Love the design and the handmade box. It is always a thrill to see what is going on at BBD!!! I would love a chance to own such a special stitching box. I can imagine it lined with one of your beautiful new fabrics. What a fabulous offer! Good luck to everyone! I would love to win this box. I love the Honeybee Hill design but have shied away because of the price of the box. Thank you for offering it as a giveaway. The fabric is beautiful! I would love to win the box. Thank you. I know I'll never make a chance for the box but I want to make you a compliment for the lovely blue fabric and the new cross stitch design. Love the new fabics and the new cross stitch. 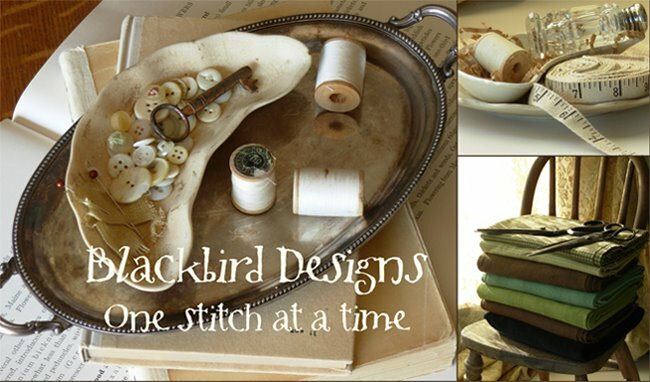 I love to do both quilting and cross stitch by Blackbird Designs! I really like the whitewashed look of the box and would love to win one. I can't wait to see all the new fabrics up close. I just love the new fabrics!! Thank you for the chance to enter your giveaway. Oh how generous!! I would love to wing something as it's been a long time since I won anything! What beautiful cross stitch! The box is gorgeous and I appreciate the chance at the giveaway! Thank you! Love the beautiful cross stitch box... such a treasure to give to a good friend! Please enter my name in the box giveaway...! Very pretty box. Please put my name in the drawing. Thank you. This piece is already on my list to order next week... that box would certainly be wonderful to have! Thanks for the opportunity to enter. As usual, fabulous fabrics.Thanks for the fun!! That pattern is also my favorite of your releases at Nashville! Hope I win! Love the new fabrics and designs!! Please count me in for a chance at the box ~ thank you!! I love the new patterns. Especially the honeybees on the crossstitch on the box. Thanks. I love it and would love a chance to give it a great home - in my home! Please, oh, please, pick me! I have already started to stitch the piece for the top of the box! The new fabrics are beautiful too! Honeybee Hill was my favorite release this time! Please enter me in the drawing as well. Stephanie's sewing box is wonderful. I know just where it would look lovely at my house. When is Nature's Bounty to be released? I have had my heart set on a blue and cream quilt and the color range is perfect. Hi Alma, please enter me in your generous giveaway. Thank you. Oh yeah......put my name in the mix. You two ladies have done it again with wonderful designs for cross stitch and fabric. We all know we can count on your creative talents. Thanks. Wonderful box! Please enter my name in this giveaway, thank you for the chance! Love those fabrics, so beautiful! Love your new fabrics and the new designs. The box is so pretty. Thanks for the opportunity to win one. Oohhh! I absolutely LOVE this box. Please include me in the drawing. Ooooo Laaaa Laaaa....the fabric is beautiful and so is the box. I would love to win one. Thanks for the chance. I love Barb's Honeybee Hill pattern and look forward to stitching it and putting it in this nice box! Oh I love the sewing box! And your new fabric line is beautiful! Honeybee Hill is just the beautiful burst of spring that is needed today. I would love to win the. Perfect box for finishing. Love the blue & white patterns in your new fabric line and the sewing box is to die for! Oh what a wonderful box to go with your wonderful pattern! You girls sure know how to do it! I would love to make my very own Honeybee Hill! Pick me, pick me, pick me LOL!!!!!!!!!!! Love the new fabric and all the market releases :-). Your new line looks wonderful - love the blues. I also love Barb's Honeybee Hill -thanks for the opportunity to be entered in your giveaway. Oh gosh Alma, I would be tickled pink if I won the box! I already have the pattern! I really love your new fabric! The blues are so pretty. Would like a chance to win the box, too. Oh my goodness - honeybee hill is delightful and the box is lovely, too. Love, love this box. Love the fabric too. What a wonderful new line of fabrics and patterns you've created!! I'd love to win this lovely box! Love the box. Your new fabrics look great also! Please enter me in your drawing.